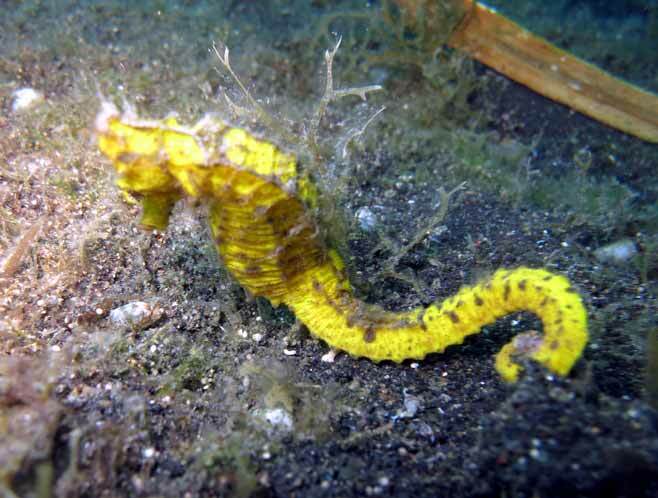 In this post: diving in North Sulawesi. Seeing some of the strangest creatures alive doing muck diving at the world famous Lembeh Strait. Diving in the blue with bigger animals on the coral walls of Bunaken. Dive Lembeh strait on a backpacker’s budget. Prices Accommodation Transport and some of my favourite Photos. My main motivation for visiting Sulawesi was to dive the famous Lembeh Strait. This is one of the best places for muck diving in the world. Muck diving is hunting for weird and wonderful creatures. The name originates from the sediment that lies at the bottom of many dive sites – a frequently muddy or “mucky” environment. The Lembeh Strait has a reputation for being home to some of the strangest and most rare marine animals in the world. This place is any photographer’s dream. Close-by Bunaken is well known for very different kind of diving, blue water, steep walls with big fish and other pelagic species. After about a month of very interesting overland travel and several dives in south and central Sulawesi I arrived in the island’s northern capital, Manado. There are many daily flights to Manado. From Manado I went to Bunaken Island by public boat. The island is truly beautiful, tropical jungle surrounded by mangroves running into the ocean. From the mangroves a 2m deep fringing reef extends about 50m into the ocean ending in a spectacular drop into the deep. The drop-off makes for great wall diving. The coral around Bunaken creates a beautiful and healthy reef. Snorkeling around the island was very good, with the drop of close to shore allowing for great free diving on this amazing reef. The dives I did in this area were good with over 20m visibility I saw many turtles, fish, a couple of Jacks and a big Napoleon wrasse. Unfortunately I was struggling with a cold that made equalizing difficult and I could not do as much freediving as I would have liked to. I dived with Immanuel Dive Center that is linked to Daniel’s resort. I used my own gear, enjoyed the dives and was happy with the divemaster. The snorkeling in front of the resort was very good. On recommendation of a fellow backpacker I went to Daniel’s Resort. There are no budget (dormitory) options for backpackers on the island. You can try to organize a home stay in one of the local settlements. Daniel’s was the cheapest accommodation that I could find. I enjoyed staying here. Each bungalow has its own hammock, it was nice to lie in a hammock and read when not underwater. Accommodation includes three meals. The food was fine, a lot of rice and chicken typical budget South East Asian cuisine. Prices: Standard Room (double bed or 2 singles) IDR 250 000 ($19) person/night including 3 meals. From Manado you can take a public boat to Bunaken. It departs from the canal on the north side of Manado market (Rp50 000 ($3.80) one way) daily at 2-3PM (not on Sundays). The main reason why I traveled to the north of Sulawesi was to dive the famous Lembeh Strait. This area is world renowned for its muck diving with unreal critters and did not disappoint. I decided to stay in Bunaken where I could snorkel from the shore and do a day trip to The Lembeh Strait. Arriving at Lembeh it feels more like a river than the ocean, being surrounded by jungle and massive trees, with black sand and volcanic rocks everywhere. 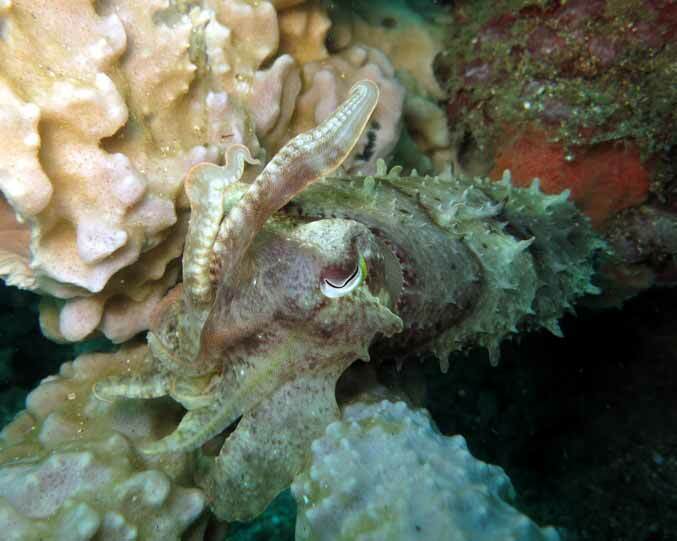 Diving Lembeh is entering a world of alien creatures. We did all our dives on black volcanic sand, a flat landscape with no reef or coral insight. The underwater landscape here is not really interesting or beautiful and there is a lot of rubbish scattered on the black sea bottom. The unique creatures you find in this area however is amazing. I saw many animals for the first time and some I did not even know existed. 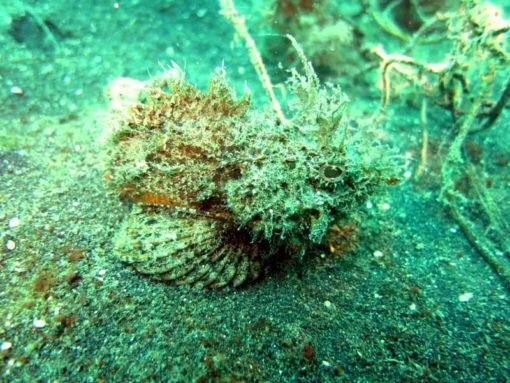 Some of the unreal creatures I saw diving here was a mimic octopus, a hairy frog fish, hairy scorpion fish, spanish dancers, a variety of ghost pipe fish, a variety of nudibranches and different color and size frog fish. 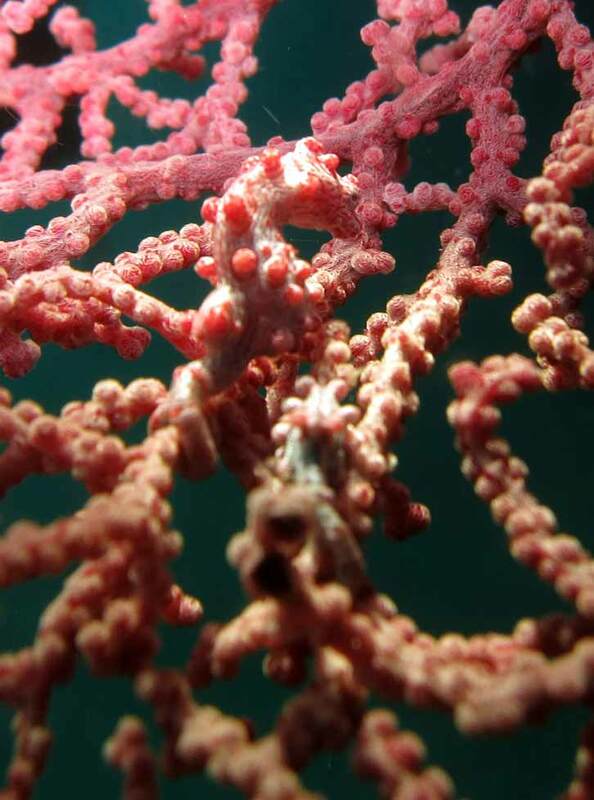 Our wake up dive guide spotted a pygmy seahorse not much bigger than my thumbnail, very well camouflaged, in a sea fan. 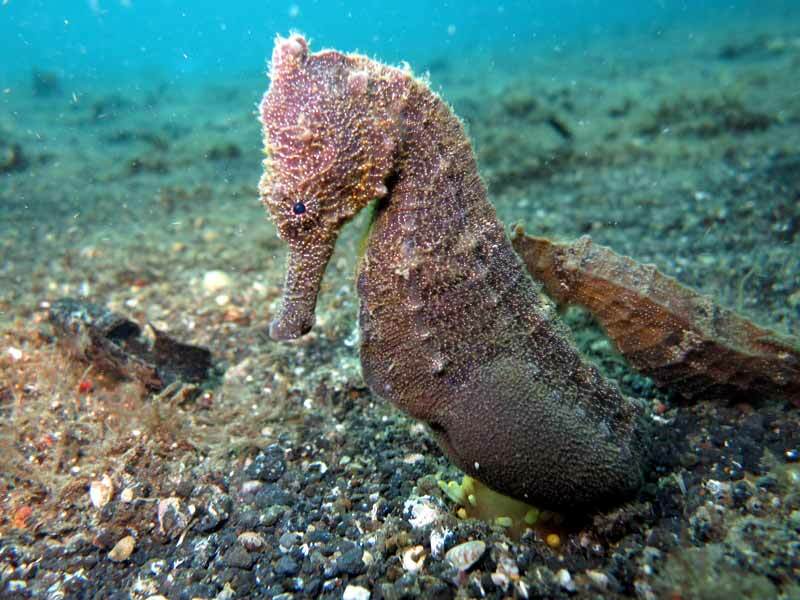 Seeing almost 20 sea horses, many different kinds, on one dive was amazing. 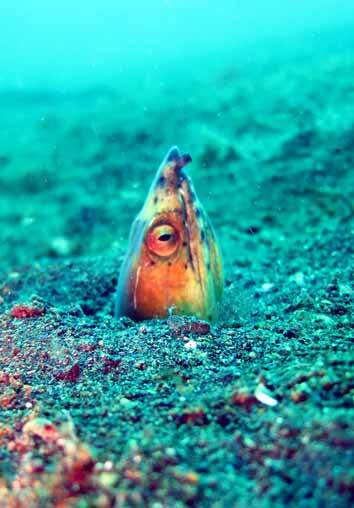 The highlight of diving at Lembeh was that I was very lucky to take a picture of a Flamboyant Cuttlefish catching a mysid shrimp. Heading North. – Funeral ceremonies, hanging graves, coffee farms and a crazy bus chase in Tana Touraja. Central Sulawesi. – Awesome island adventures. 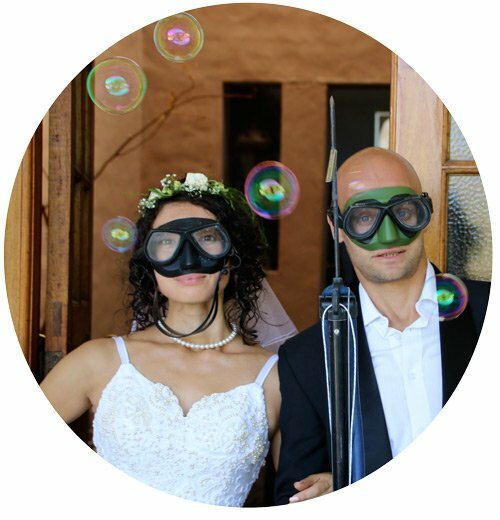 Diving on a plane wreck, spearfishing and staying with the famous Bajua people (sea gypsies), swimming in a jelly fish lake around The Togian Islands. To get to The Lembehs Strait on your own is a mission and I took a package deal with Immanuel Dive Center in Bunaken. The package included transfer via Manado by boat and taxi to Lembeh. 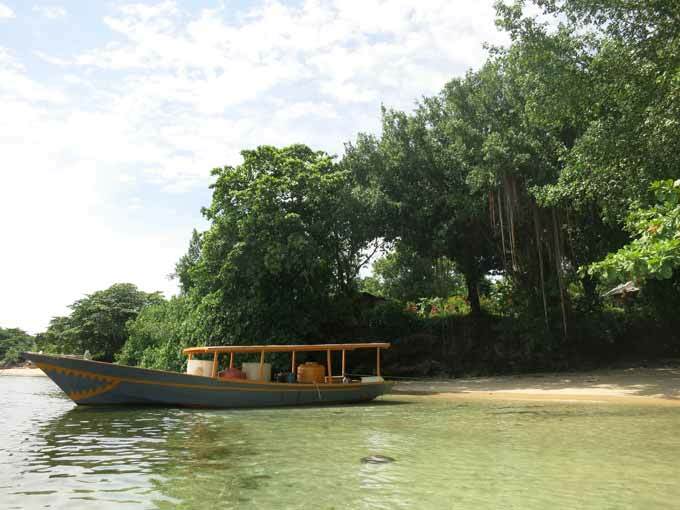 transport from Bunaken to Lembeh return 800 000 Rp ($60). We would love to hear from you, so don’t be shy to comment give suggestions or ask questions!